The match between these two great rivals took place with controversy before the match even began. Police were stationed outside the gates to Old Trafford confiscating a United fanzine that contained a cardboard cutout KKK mask. These masks were intended to be used to taunt Liverpool fans who have taken it upon themselves to defend the indefensible actions of their striker Luis Suarez. The real scandal happened just before kickoff during the pregame handshake, when Suarez refused to shake Patrice Evra’s hand. Evra took immediate offense to the snub and was held back by officials, while Rio Ferdinand refused to shake Suarez’ hand. Once the pre-match shenanigans were out of the way, both sides proceeded to play a mediocre first half with Glen Johnson missing just wide and Paul Scholes hitting a header right at Reina on the best chances of the half. Once the second half began that all changed, Steven Gerrard was unable to clear with his header and his flick set up Wayne Rooney for an easily volleyed finish for the game’s opener. The second came just a couple minutes later when Antonio Valencia expertly stole the ball from Jay Spearing and met Rooney with a ball that was calmly slotted home for his second of the match. The brace would be enough to see United earn their three points, but not before Luis Suarez put his name on the scoresheet after a Charlie Adam set piece fell to the striker’s feet off a deflection. 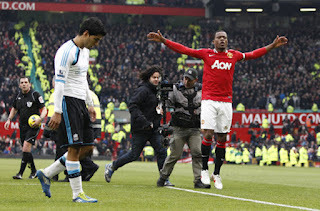 Patrice Evra made the most of the occasion by celebrating United’s victory in front of Suarez as the striker exited the pitch. Blackburn jumped out to an early lead and were able to extend that lead to three just before halftime thanks to goals from Yakubu, Steven Nzonzi, and an own goal from Nedium Onuoha. A late brace from Jamie Mackie made the scoreline respectable, but it made no difference as Blackburn ran out deserved winners 3-2. Sunderland looked to extend their fantastic run of form since Martin O’Neill took over as manager, but it would have to come at the expense of Arsenal who was looking to break into the top 4. The two sides played an extremely tight affair over the first 70 minutes of the game before James Mclean was able to break the deadlock by taking advantage of a Per Mertesacker stumble, who was substituted with a gruesome ankle injury. His replacement Aaron Ramsey had an immediate impact on the game when his shot from distance struck both posts and finished behind the goal line to give Arsenal the equalizer. Beleaguered midfielder Andrei Arshavin was another late substitute who had an impact because his cross led to Thierry Henry’s 92nd minute winner that lifted Arsenal into the top 4 for the first time all season. A dramatic finish to what is likely to be Henry’s final match with Arsenal (at least for this season) as he returns to New York on Thursday to begin preseason training with the New York Red Bulls. Chelsea continued their slump on Saturday during their travels to Goodison Park, and the London side saw themselves immediately behind thanks to a goal just 5 minutes from the start by Steven Pienaar. Chelsea was largely wasteful with their opportunities and several mistakes led to prime opportunities for Everton to extend their lead. Both teams were unable to find the net and the testy match continued until the 70th minute when Denis Stracqualursi scored the goal that put the match out of reach for Everton. The hard earned win allowed Everton to climb in to the top 10 for the first time all season. 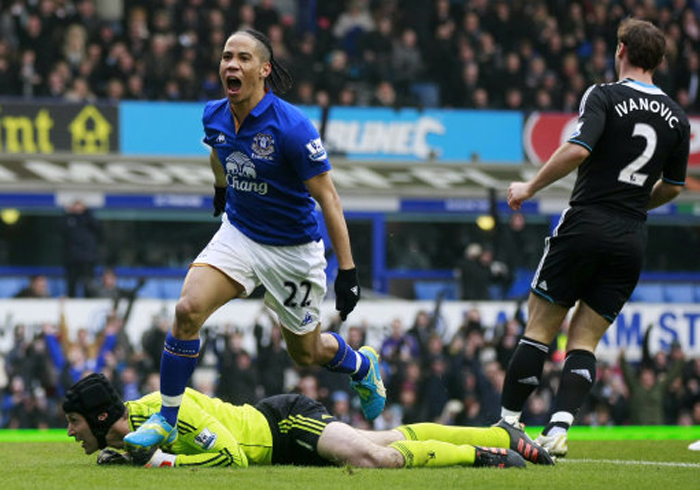 This marks the third time in three seasons that Everton has beaten Chelsea at Goodison Park. The lackluster string of performances by Chelsea led to chairman Roman Abramovich calling the squad in on Sunday day off to address their lack of satisfactory results. The chairman addressed the squad and laid out his expectations for the remainder of the season which included a top 4 finish in the Premier League and an impressive showing in the Champions League. Abramovich has displayed an increased level of patience for new manager Andre Villas-Boaz, but has chosen to take this opportunity to let the club know their performances need improvement. While many are quick to point fingers, the club will surely enjoy a boost this week with the return of both Didier Drogba and Salomon Kalou from the African Cup of Nations. This matchup between overachieving newly promoted sides had plenty of entertainment for the neutral supporter. Swansea jumped out to an early 1-0 lead thanks to a curling effort from Danny Graham. Swansea held the lead for the remainder of the first half, but their luck ran out in the 47th minute when Grant Holt headed home an overhead kick from Elliot Ward. Swansea’s bad luck continued when just four minutes later Anthony Pilkington’s shot took a deflection and found its way into the back of the net. Grant Holt found the net again in the 63rd minute to put the game out of reach, earning Norwich the 3 points, but not before Danny Graham added an 87th minute penalty to make the scoreline respectable. In a matchup between the league’s cellar dwellers, both teams were hoping to earn three points that would go a long way towards staving off relegation. Wigan was able to jump out to a 1-0 lead thanks to a header from Captain Gary Caldwell off of a corner just before halftime. Bolton responded in the 67th minute when Mark Davies blasted a shot from outside the area to equalize. The deadlock only lasted 10 minutes because Wigan found a winner coming from Jame McArthur’s rebound off of a Adam Bogdan save. Three hard earned points for the Latics that could be very important at the end of the season. Two first half helped Fulham sink visiting Stoke City. Pavel Pogrebnyak scored his first goal in the Premier League for the game’s opener and Thomas Sorenson was unlucky to have a Clint Demsey blast rattle off the bar, off his back, and into the goal. Ryan Shawcross pinned one back for Stoke City off a headed corner, but Fulham was able to hold on for the win. This matchup was expected to be one of the weekend’s most competitive matches, but a sublime performance from Emmanuel Adebayor was the key to Spurs’ thrashing of Newcastle. Adebayor tallied four assists on the day and added a goal to lift Tottenham to their 5-0 win. The first goal came off an Adebayor cross that trickled across the goal mouth for Benoit Assou-Ekotto to finish. The second came off a perfectly placed cross from Adebayor that found Saha alone in space for the finish. Adebayor then settled the ball to Saha who added his second for the game’s third goal. Adebayor then jumped on his own rebound and moved the ball to Niko Kranjcar who slotted home the 4th goal. Saha headed on a ball that was volleyed home by Adebayor for the final tally of the day. It was a great night for Spurs fans and one that Newcastle supporters will be looking to put behind them. Wolves were on the receiving end of a 5-1 thrashing from West Brom which directly resulted in the sacking of manager Mick McCarthy. West Brom opened the scoring with a strike from Peter Odemwingie that found its way between the legs of goalkeeper Wayne Hennessey. Wolves were able to level the match just before halftime when Steven Fletcher placed a shot over the outstretched hands of Ben Foster. West Brom came out after halftime with a fury and added 4 second half goals. The first came from Jonas Olsson after a scramble in the box following a corner. Another goal mouth scramble and a back heel pass allowed Peter Odemwingie to net his second of the game for West Brom’s third goal. Keith Andrews added the fourth West Brom goal before Peter Odemwingie completed his hat trick with an easy finish off of a cross from James Morrison. Villa Park was the setting for a match that was equal parts boring and uneventful. Manchester City won 1-0 thanks to a 62nd minute hooking shot from Joleon Lescott. The win means City is back at the top spot of the table, but I honestly wish they had done it in a more entertaining fashion. That’s all for this post, Adebayor gets the background for his super Saturday display. More to come on the African Cup of Nations Final and Real Madrid’s 4000th club goal.